Before edge blending can occur, the projectors and software application need to be set-up so that an overlapping region between the edges of adjacent projectors is present. Align the projectors to the calculated overlap. Modify the software application to have the same calculated overlap region. As an example, here we present overlapping regions based upon a three projector setup. Each projector has a resolution of 1280×1024 (SXGA). Figure 1: Example overlapping regions of 3 SXGA displays. Note: It is good to have a complete number of pixels and the same physical screen size when edge blending. However, because of different projector resolutions, it is good to standardize on the same overlapping region. Once the overlapping regions have been calculated, we can then align the projectors and software. 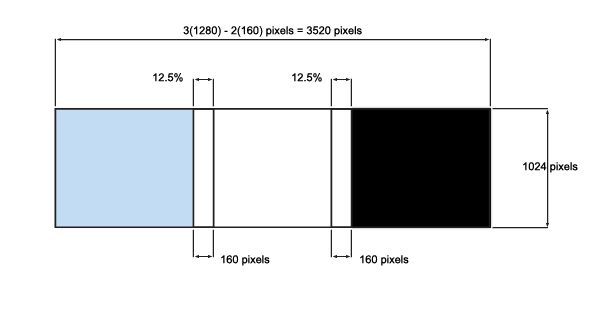 Figure 2: Projector layout with overlapping regions. The exact layout of the projectors will change depending upon screen size, screen shape and the optics of specific projectors used. Here for illustrative purposes, we show an example of projector placement on a curved screen with the overlapping regions described above. Once the projectors are aligned, overlapped and ready to go, the software then has to be adjusted to provide the same overlapping regions. Below we show an image before and after overlap regions are implemented. Figure 3 shows the original image and Figure 4 shows the overlap regions created to correspond to the same regions as described in Figure 1. Figure 3: Original software image. Figure 4: Software setup to produce overlapped regions. Note: It is worth noting that some applications won’t support overlaps as a standard function. Due to the number of different software applications available, it is beyond the scope of this section to describe how to perform this function for each possible method. However, if you have any further questions, please contact us. Once the overlap regions have been created, the next step is edge blending.